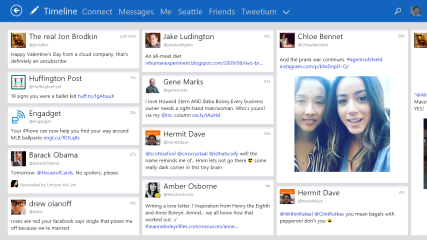 Tweetium 2.0 brought all the great new design updates and features seen below. But a lot has happened since then! 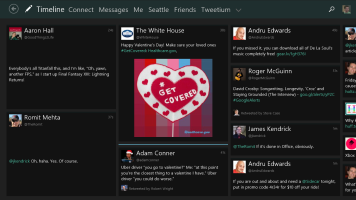 Tweetium 2.0 has a new default theme we think you'll love. Of course there's a dark variant too! And all the original themes are still here. 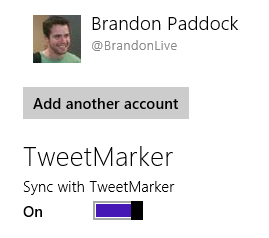 Pro users can now enable TweetMarker sync in the Account Settings page. 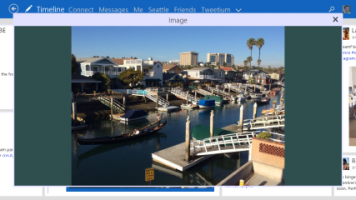 Tap or click on an embedded image or a user's profile picture to see a full size version. 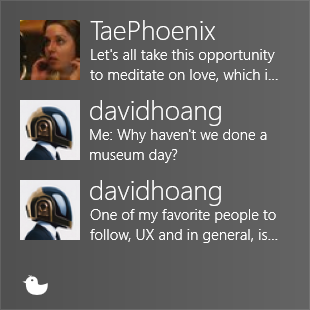 Tweetium's live tile now updates more regularly with unread mentions and DMs. Additionally, you can now optionally select a pinned list or timeline to feature recent tweets there! New themes! A new White 2.0 theme is now the default, and a new Dark 2.0 theme is available. Users can now be blocked, unblocked, and reported as spammers from their profile pages. The search box is now collapsed to a glyph by default, giving more space in the nav bar. Search can now be used at smaller window sizes. Fixed a bug where duplicate DM tiles could appear after collapsing a thread.